This is the 2012-13 Mentor-Mentee Project developed by Liz Maas, Math/Science faculty at Kirkwood’s Iowa City Campus. 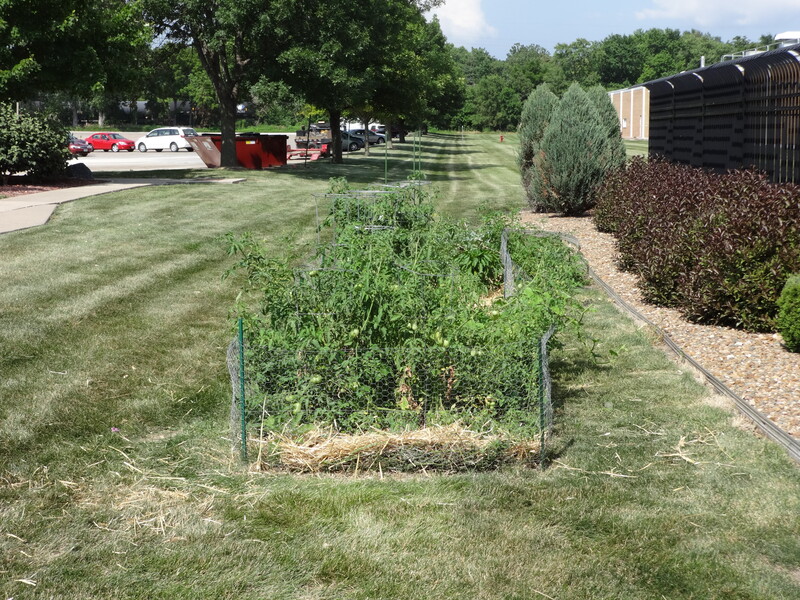 In the spring 2011 semester, as an adjunct, I started a small community garden at the Kirkwood Campus in Iowa City. Since space is limited at this campus I contacted the neighboring facility to the south, Oral B/Proctor and Gamble (P&G), to see if we could use a portion of the space that is adjacent to the main credit center, but actually belongs to P&G. My contact was very accommodating and said that so long as we did not install any permanent features/structures we were welcome to use the space. Eric Miller, a sociology instructor and I are the faculty leaders for the Environment and Ecology Club in Iowa City. We organized two different gardening preparatory workshops with the help of a local non-profit organization, Backyard Abundance. During these workshops we evaluated the space and determined the best location of our beds, what plants would be appropriate and other ideas to continue the garden beyond the 2011 season. The first workshop was to identify the garden “space” and then the second workshop was to determine what plants we would grow, where they would go, etc. During the first workshop we evaluated the proposed area, performed a One Call – to determine the location of any electrical, cable, or other underground utilities and then selected two gardening sites. 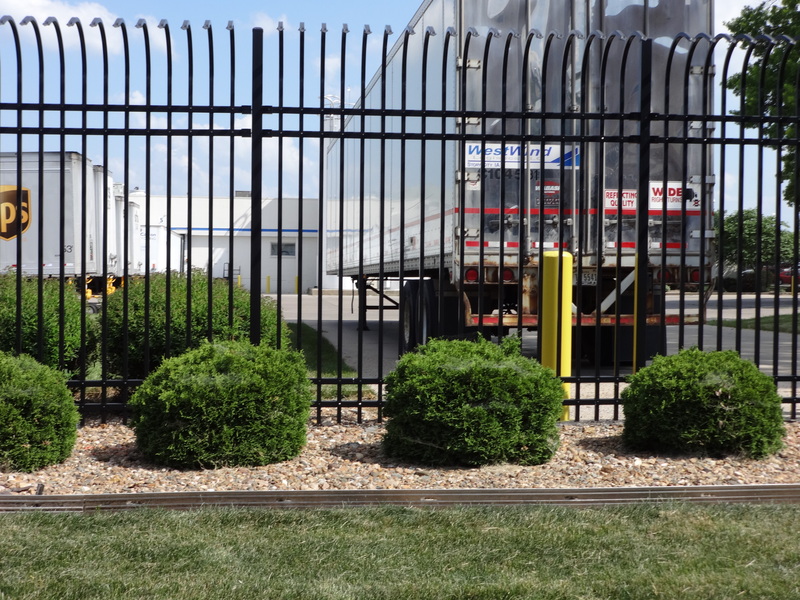 The first one is directly outside of the building along the southeast end and the second is north of the first bed. Both garden beds were initially established using the sheet mulching method. With this method you cover the sod with large sheets of cardboard, for 6-8 weeks in the early spring so that the turf underneath dies. Then upon removing the cardboard, you can more easily dig up the dead sod and fill the open area with compost imported from the City of Iowa City landfill. This process protects the soil from erosion, does not require the use of a tiller so saves on rental fees, and the use of a petroleum fueled vehicle. All of these environmentally sensitive components we discussed with the student gardeners, during our workshops. During our second workshop, we determined that the first bed was a “shadier” bed and that we would plant cabbages, broccoli, lettuces, etc. The second bed contains the “sunnier” species, things like tomatoes, squash, peppers, and onions. We selected varieties of things we liked to eat and started seeds indoors. When these plants were ready to go in the ground, we organized both club members and students from my Environmental Science classes and students from Eric’s Social Problems classes to help plant. 2011 proved to be a bountiful year, but the challenge was getting the produce harvested! Naturally, students who had participated in the garden in the spring had either graduated or were not taking classes. 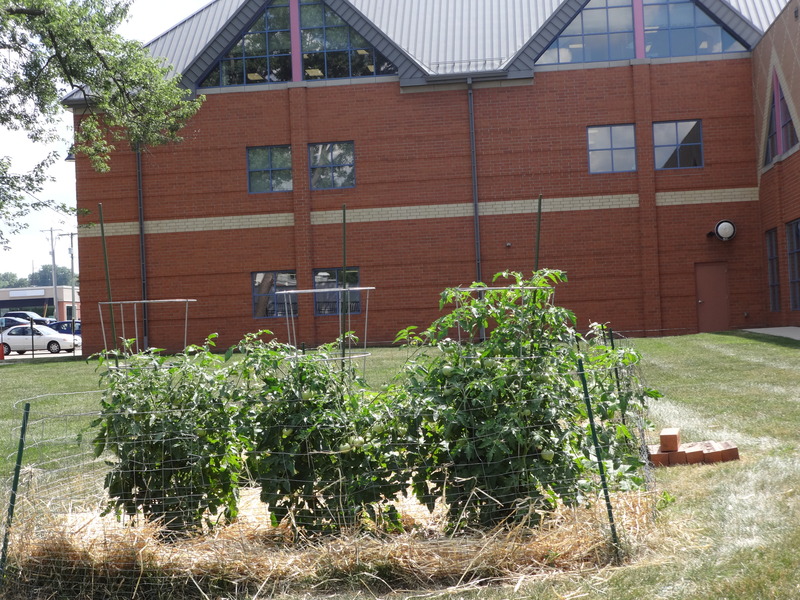 While some staff and summer faculty made use of the garden, there was much produce that was wasted. I recognized this as a problem and determined that we needed a mode of advertising or awareness building to improve use of the garden. The 2012 growing season produced similar results; too much produce and not enough harvested. But as an adjunct I did not have the time or energy to dedicate more to the garden effort. I was very frustrated as I could see and had witnessed the many different ways that a community garden could be useful to a variety of instructors and their curricula or to students and their sanity. For example, the cantina at the Kirkwood campus had been leased to a private business who hosted a nice café for our students. When the lease ended in the fall of 2012 the business decided not to renew. Instead, Kirkwood’s own culinary program decided to provide food service for our population. This was an exciting change of events; one I hoped to connect to my garden. 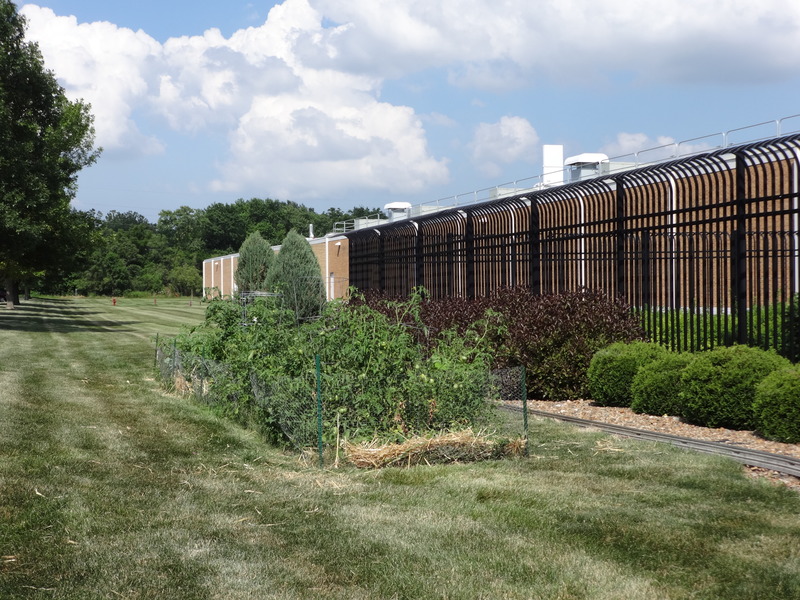 I knew that the Cedar Rapids culinary program had added back of the house composting (composting food waste on the preparation end) and it was one of my hopes that we could do that in Iowa City too. Then turn right around – full –circle – and use the compost in the garden! Conversely, perhaps the garden could grow herbs and greens for the café? I realized that many of these connections take time to develop and not all may come to fruition, however, a small little garden wasn’t going to fulfill any of these ideas and as an adjunct there was even less hope of finding the time and energy to make it happen. Then I was hired as a full time faculty member and Dave Hall became my mentor. When we discussed our mentor/mentee project I was very surprised to discover that someone I had worked with for several years was also a gardener! Dave mentioned that he had interest in the Kirkwood garden and wanted to do our mentor/mentee project with the garden. I described to him the challenges and told him that not only did I want to enlarge the garden, but hoped to improve awareness and use of the garden. Dave was excited by this project because he teaches Nutrition and thought that an on-site garden could be a great addition to his Nutrition curriculum, as well. Initially we wanted to host a “Public Thank You” event for P&G to not only thank them but also bring a little attention to the fact that we have a garden (part of that awareness building)! However, after multiple efforts at contacting the point of contact at P&G and never receiving a response, we determined that we would need to move our project in a different direction. Since I have an 8 year old who attends 2nd grade at Horace Mann Elementary, one of the Iowa City Community School District schools, I knew that there was a movement to integrate gardens and gardening in the k-12 school curricula. One of my friends is employed by a local non-profit organization Field to Family, and she mentioned that there was a need for a collaborative group on the east side of Iowa City that would provide discussion, sharing, and ideas about how to keep, manage, maintain school gardens. Besides enlarging the garden and rallying more support for and use of the garden, we have also started an Eastside Iowa City Community garden forum. 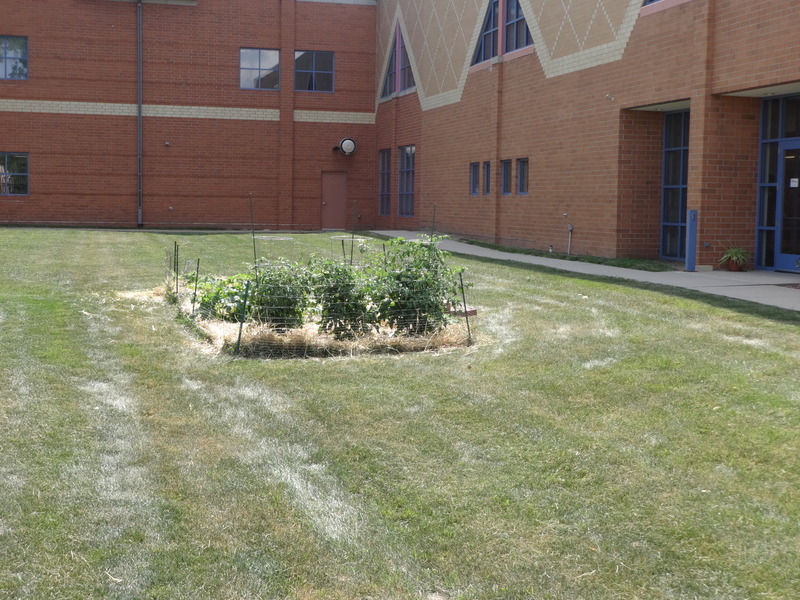 We now have a small group of 6 different school and community gardens who will collaborate more on all of their gardening aspects; what to plant, planting tips, what to do with the excess produce during summer time when there are fewer students, how to share produce with community food programs, etc. This collaborative would be a long standing group that would meet at least 4 times throughout the spring, summer, and fall seasons. While this collaborative is still in its infancy, it is intended to provide additional outreach for Kirkwood students, opportunities for elementary, junior high and high school students to connect to Kirkwood, and greater networking opportunities for those associated with the group. The schools include: South East Junior High, Grant Wood Elementary, Mark Twain Elementary, Lucas Elementary, Elizabeth Tate High School, and Kirkwood Community College. This spring the Environment and Ecology Club again planted seeds indoors and has started some outside. However, after a very cold and wet spring we are “behind” in our regular timeline for garden planting. But as soon as the semester is over, Dave Hall and I will enlarge the garden, get more things planted and rally the summer staff and students for their participation. Concurrently we will work with the other east-side gardeners to promote collaboration in our community and sharing of local produce. Hopefully this is just the beginning of a larger, greater opportunity for Kirkwood to work with other educators, families, and friends! Since this project is on-going and seasonal I don’t feel as though I have accomplished very much in the physical sense. However, I learned about a colleague’s interest, collaborated with other gardeners, and look forward to a summer filled with time in the garden and plenty of produce. I hope that over the next few years there can be many other ways that the garden could be integrated in to other curricula. For example, I would love to work with colleagues who teach business. We have discussed an event where the Environmental students make pesto or salsa and then the Business students sell it! There could be recipe development, market research, carbon footprint assessments, and perhaps even some small revenue generated! Now as a full time instructor I finally have the time to develop the garden and see what fruit it could bear! I love this project, Liz, and am glad to hear it is still growing. I had a friend in another city who would pay the farmer’s market fee for a stand and then all through the farmer’s market season, whomever had something to sell could sell there. I don’t know all the details, but there’s an idea for you, too.